The Wordless Leonard Cohen Songbook is a graphic retrospective of Canadian singer-songwriter, poet and novelist Leonard Cohen’s career. Consisting of 80 black and white wood engravings, the book was crafted by master engraver George A. Walker in honour of Cohen’s 80th birthday. In The Wordless Leonard Cohen Songbook, master engraver George A. Walker provides a new perspective on a man whose words have captivated generations. Walker’s latest wordless narrative presents a suite of 80 wood engravings commemorating the life and artistic accomplishments of Leonard Cohen, the Montreal-born poet, novelist, and singer-songwriter whose career has spanned almost six decades. Best read to music, The Wordless Leonard Cohen Songbook presents images of Cohen’s iconic public persona alongside vivid interpretations of his ever-evolving work. The engravings compose a biographical mosaic that invites readers backstage, behind the curtains of Cohen’s critical and commercial acclaim. Some scenes are drawn from history; other depictions arise from imagination and interpretation. These images encourage us to search beyond the visual elements and to see in them a poem, a song, a meaningful turn of phrase. They urge us to look beyond the black and white and to consider Cohen’s life and work through the lens of our own experience. 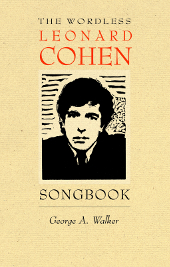 The Wordless Leonard Cohen Songbook originated in celebration of Cohen’s 80th birthday as a limited edition of 80 copies hand printed in Walker’s studio in Leslieville, Toronto. Beautiful engravings capture the long life of a music legend. The Wordless Leonard Cohen Songbook, by Toronto-based artist George A. Walker, delivers exactly what the title promises. 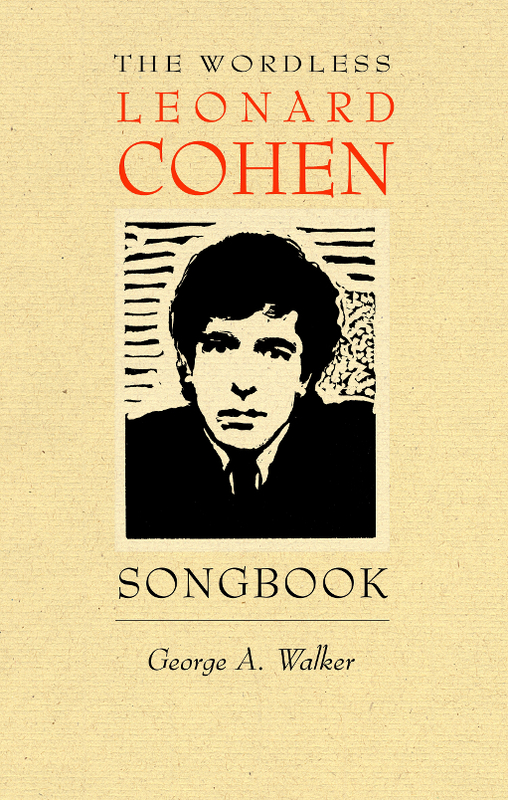 The book includes eighty wood engravings that depict Cohen’s life and influences, from his childhood to his recent tours. It’s a cool idea, and the engravings are beautifully done. The presentation might limit the material’s appeal to Cohen’s existing fan base, but the book is a lovely keepsake for that audience. The engravings originated as an eightieth birthday tribute to Cohen, and were originally printed as a limited edition by the artist. The songwriter behind masterpieces from "Famous Blue Raincoat" to "Chelsea Hotel" has led an interesting life, giving Walker plenty of material for his artwork. From the first image of a young Cohen riding a tricycle to the several engravings of him as an elder statesman on stage, Walker creates visuals that tell the musician’s life story. He uses the contrast of black and white well, ages his subject accurately, and evokes the singer’s appearance without the engravings looking too photographic. Some of the images are inspired by famous photos of Cohen with his contemporaries, imaginatively depicting Jimi Hendrix, his then-lover Janis Joplin, or Phil Spector (shown pointing a gun at Cohen). Others depict figures who drew Cohen’s interest, including poet Federico Garcia Lorca and Saint Kateri Tekakwitha. These images are interspersed with portraits or performance images of Cohen. The book’s foreword suggests viewing the engravings while listening to music, and they do flow nicely when perused as a Cohen album like I’m Your Man or Songs of Love and Hate plays in the background. While most of the engravings stand alone perfectly well, the book would benefit from a list of image titles or descriptions; this could be provided in a way that wouldn’t impede the engravings’ visual impact, but would provide context. With the format as is, much of the work’s significance may be lost on more casual Cohen fans or on curious parties looking to learn more about him. (The identities of some of the influences depicted may not be immediately clear even to Cohen devotees.) With no text other than the introduction, a foreword, and an essay in the back about Cohen’s embrace of Zen Buddhism—the introduction being the only one of the three written by Walker—there is opportunity to offer a little more information. That said, The Wordless Leonard Cohen Songbook definitely succeeds as an art book, thanks to the quality of Walker’s engravings; and as a collectible for Cohen fans, thanks to how well the artist captures his subject. This book is an 80th birthday present to Leonard Cohen. A tribute to his novels, poetry, and music, it is a narrative without words. This is a coded narrative. The images are chronological starting with the young Leonard Cohen on his tricycle and ending with an image of Cohen with a nurse. I took that last image from a story he told at a concert I attended, where he imagined himself smoking and being cared for by a young nurse. Many of the other images were inspired in part by Sylvie Simmons’ biography, I’m Your Man: The Life of Leonard Cohen (2012). And of course I was influenced by the poems, lyrics, and two novels of Leonard Cohen. I wanted to play with the way the image of Leonard Cohen appears in pop culture. I sought out symbolism behind the number 8, which is significant in Cohen’s life and will help readers decipher the narrative. I made 80 copies of the hand-printed edition of this book. There are 80 wood engravings with images that mark points in Cohen’s life. Cohen is a Zen Buddhist monk, and the noble eightfold path to enlightenment is a significant teaching of the Buddha, who described it as the way leading to the cessation of suffering (dukkha) and the achievement of self-awakening. The first step in the path is Right View, and that is certainly part of the question I asked as I worked on these images: What is the right view of the life of Leonard Cohen and the popular culture that surrounds him? There is no single key to the reading of this book. Although knowledge of people, places, and relationships in Leonard Cohen’s life will help readers recognize the images and show their significance, I encourage you to bring to the narrative your own associations and recognition of the players and scenes. Read the images with Leonard Cohen singing in the background while you sip a glass of wine and flip through the 80 engravings I’ve conjured to frame a complex man into a series of pictures. Here are clues to some of my choices and placements. The eighth engraving is a portrait of the Spanish poet Federico García Lorca (1898–1936), whose work Cohen loved so much that he named his daughter Lorca Cohen. (The lyrics of "Take This Waltz" derive from Lorca’s poem "Pequeño Vals Vienés.") The fourteenth engraving is of Kateri Tekakwitha, a seventeenth-century Algonquin-Mohawk saint who fascinated Cohen and is featured in his novel Beautiful Losers. I made a connection between Kateri and the number 8 by using her birth date—the 17th of April (1+7=8). Among many others, you’ll find portraits of poets Irving Layton and Allan Ginsberg; publisher Jack McClelland; author Pierre Berton; singers Judy Collins, Joni Mitchell, Jimi Hendrix, Janis Joplin, Lou Reed, and Nico; artist Andy Warhol; songwriter / record producer Phil Spector; Marianne, Cohen’s Hydra Island muse; and the two Suzannes in his life—Suzanne Elrod (his ex-wife), and Suzanne Verdal (the subject of his song). I did not include everyone in Cohen’s life—just those I thought would make interesting engravings. My apologies if I left out someone important to you. 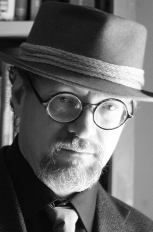 Cohen’s compassion for others is seen in his music, novels, poetry, and art. It is one of the elements of his work that has profoundly affected me, his deep empathy for others. Famously during a concert at a mental hospital, Cohen stopped to listen to a patient who was heckling. The man, who had a triangle missing from his skull, hollered, "Okay, big-time poet, big-time artist, you come in here, you’ve got the band with you, you’ve got the pretty girls with you, you’re singing all these pretty words and everything, well what I want to know, buddy, is what do you think about me?" Cohen stopped playing, left the stage, walked over to the man, and began to hug him. I made an engraving of this event because it seemed to represent compassion for the underdog as well as genuine understanding of the inner struggles we all face. "Forget your perfect offering," Cohen observed. "There is a crack in everything. That’s how the light gets in." Those words speak of hope within despair.